The recently completed F1 race brought a lot of change to one of Valencia’s most interesting barrios, El Grao. Bordered between the Mediterranean port to the east, C/ Ibiza to the west, C/ Francisco Cubells to the north, and the Turia riverbed to the south, El Grao not only provides the setting for most of the F1 circuit, but is also a lively residential area with a history all its own. Start by taking Metro Line 6 to station “El Grao”. You’ll be let out at Plaza de la Armada Española, a circular plaza near the harbor, featuring a large monument to one of Valencia’s favorite sons, Joaquín Sorolla. This is the easiest spot at which to gain access to the harbor promenade. Spend some time walking up and down the harbor, checking out the various America’s Cup buildings. Depending on your level of interest, go into the House of the America’s Cup — it’s free. Walk down towards the main maritime station. Once you’ve reached the emblematic Edificio del Reloj (building of the watch), you’ll know you’re there. This grand, white building was constructed in 1939 in something called the “neoplateresca” style (architectural students: feel free to explain! ), and is today used as an exposition hall. 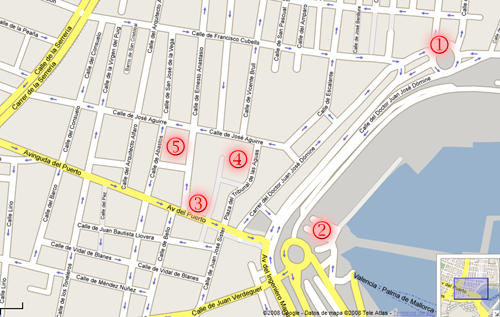 Also, be sure to visit the estación maritima and massive tinglados (warehouses). 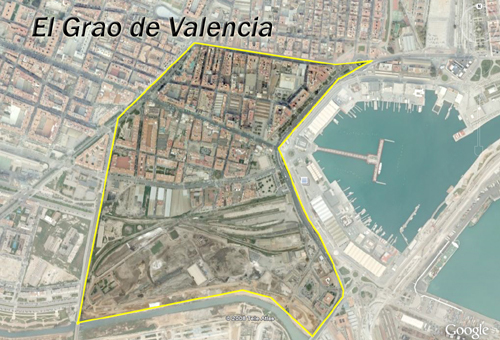 More than half a million tourists enter Valencia on cruise ships from this port every year. Once you’re done with the port, exit onto Avenido del Puerto — the closest thing El Grao has to a Main Street. Walk a few hundred meters up to the Plaza del Tribunal de Aguas, and gaze upon the massive church of Santa Maria del Mar, which was built after fisherman retrieved a massive wooden cross from the sea. The cross is still prominently displayed over the main entrance. The church is extremely well-preserved, and is the unofficial capital of Valencia’s Semana Santa activities. It’s only open during services. Now it’s just a short walk through the Plaza del Tribunal de Agua, before you arrive at El Grao’s most unique landmark: Las Atarazanas (shipyards). The building, made of 5 huge arches supporting a wooden roof, was built by El Grao’s Moorish rulers in the late 14th century, and has been beautifully restored. Today, it’s used mainly as an exhibition hall. Getting tired? You’re just about done! Leave Las Atarazanas to the north, and walk westward down C/ de José Aguirre until you come to El Grao’s neighborhood market. This is a much smaller, less threatening market than Mercado Central and, if you’re like us, you can have a lot of fun watching hobbling old ladies go from stand to stand to do their daily shopping. It seems as though everyone knows each other. Once you’re done in the market, we recommend walking back out onto Avenido del Puerto, just because it’s the most lively street. 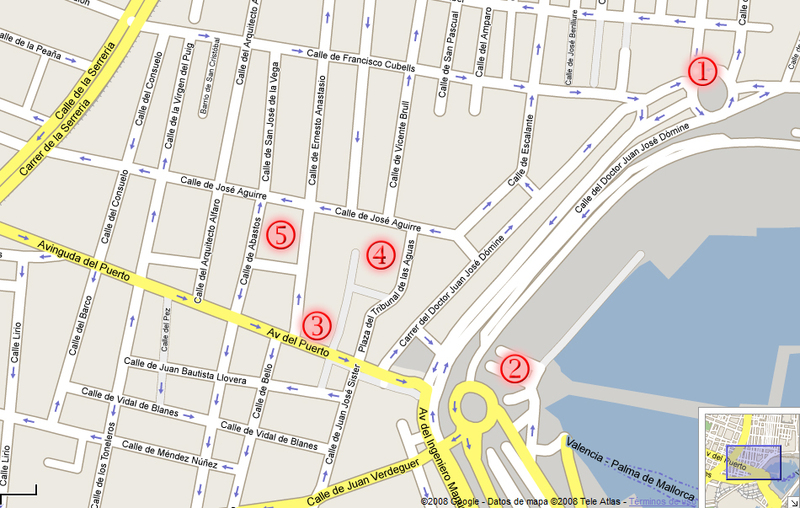 You can walk until it ends, and then northward on C/ de la Serreria, until you reach the Metro station Maritim-Serraria. That covers the neighborhood’s main highlights. Of course, there’s much more to see and do in El Grao, and we’re big proponents of walking around randomly. If all the exercise gets you hungry, there’s a good, cheap meal waiting at Bar El Chaflán on C/ Calle José Aguirre (location). We were brought there by an elderly couple who’ve been patronizing it every day for the past 3 years. Now that’s a recommendation!